A report into Australia's worst bushfires has called for sweeping changes to the way the authorities respond to natural disasters. Some 173 people were killed when fires tore across Victoria in early 2009. Over 155 days a royal commission heard complaints from a string of witnesses about a lack of official information. The report says authorities should build shelters in vulnerable areas and devise a full evacuation plan. Victoria has vowed to act swiftly on the report. The state government says it will make a decisive response to the sharp critique of its actions. Poor official information about the speed and direction of the fires was a major complaint among the more than 400 witnesses who gave evidence to the commission. They said the emergency system simply fell apart under pressure. The 2009 Victorian Bushfires Royal Commission was established by the federal Australian government to investigate the causes and responses to the bushfires, which swept through the state in January and February that year. The panel, which was headed by a former Supreme Court judge, also examined the individual circumstances of each of the deaths. One of the most significant of the 67 recommendations in the report is the call for an overhaul of the so-called "stay and defend or leave early" policy, which has been a mainstay of fire management across Australia. Many of the people who died acted on official advice that if they could save their house they could save themselves. The advice was only withdrawn after "Black Saturday" on 7 February 2009, when hundreds of fires started north of Melbourne as temperatures soared to 48C and strong winds blew in from the interior. Rather than abandoning the "stay or go" policy, the commission recommends adopting a hybrid model that includes strengthening public warnings, providing designated community refuges and bushfire shelters in areas of high risk, and developing plans for emergency evacuations. The report also says that leadership during the crisis was "wanting", and recommends appointing a fire commissioner in each state. Victoria's former police chief commissioner, Christine Nixon, was criticised for going out to dinner on Black Saturday and being out of touch for three hours despite being charged with co-ordinating the emergency response. She resigned as head of the Bushfire Recovery Committee earlier in July. The commission says Ms Nixon, as well as former Country Fire Authority head Russell Rees and the department of the environment's chief fire officer, Ewan Waller, "did not demonstrate effective leadership in crucial areas" by ensuring that "prompt and accurate warnings were issued to communities in the path of the fires". The commission also wants the state government to roughly quadruple the amount of controlled burning it undertakes, and develop a voluntary scheme to acquire land in areas of unacceptably high bushfire risk. It also recommends that ageing power lines be replaced with underground cables. Jean Howard, a resident of Kinglake, one of the communities worst-affected by the bushfires, told the BBC before the report's publication that she hoped the report would offer constructive advice rather than simply condemning those in authority. "I know people are going to be blamed for it but... I don't think anybody can be to blame because it was a day that nobody had ever lived through or seen before, and nobody could have prepared for a day that that was." Victoria Premier John Brumby said the state government would undertake a community consultation process on the report before responding. "As premier I feel the full weight of responsibility to make sure that we get our response to the commission's report right to make sure we make our state as safe as possible," he told reporters. "The people of our state want the opportunity to have some input." The BBC's Phil Mercer, in Sydney, says many Australians who survived Black Saturday have been too afraid to return to the fire zone, while those who have come back to start again believe that more needs to be done to protect their vulnerable communities from nature's fury. 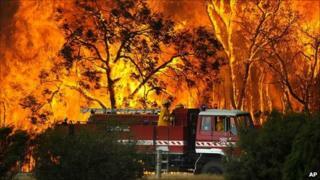 Should bushfire policies be changed? Bushfire dilemma: Flee or fight?